Editor's note: This is the fourth post in an 11-part series on the HubSpot Customer Code. You can subscribe to the full series here. Back in 2013, our support process at HubSpot was in rough shape. Wait times were long, we were understaffed, and our phone system was terrible. It wasn't uncommon for a customer to call, explain their issue to a Tier 1 rep, discover that rep couldn't answer their question, be put on hold to wait for a Tier 2 rep, only to have the call drop when the rep transferred the call. It's painful just thinking about that now -- can't imagine how painful it was for our customers. So the customer would call back, explain their problem a second time to a new Tier 1 support rep, and hope that this time when the rep transferred the call, it wouldn't drop. This was terrible for customers, demoralizing for employees, and wasn't doing HubSpot's brand any favors. The solution here felt obvious: Update the freaking phone system! Until Michael Redbord, who led support at the time, suggested that maybe the real problem wasn't our phone system, but rather that we were using the industry-standard practice of tiering and triaging calls. Sure, customers didn't like having calls dropped. But really what they really wanted was to get their question answered ASAP by the very first person they spoke with. No menu, no call transfers, no escalations, no manager approvals needed. Fixing the phone system would have solved a problem for us, but it wouldn't have solved for the success of our customers. So instead of deploying a new phone system, we got rid of our triage process, reorged our team, and invested in training for our frontline staff. More customers were now calling in and getting their problem solved with no hold time, no transfer, and no escalation. They loved it. We were solving for their success. Five years later as I began thinking about The Customer Code, this story was still top-of-mind because it was a fresh way to think about a problem. I'm a technologist. I solve problems with technology. I like systems. But customers don't care about phone systems or industry-standard triage processes. Customers don't care about our departments (or those departments' dysfunctions). Customers just want you to deliver on what was promised -- that they would be more successful with your product than they were without it. The third tenet of The Customer Code is: Solve for my success, not your systems. We gave ourselves a 6 out of 10. This is not a score I'm proud of, but I think it's an accurate reflection of the work we need to do. We're guilty of making some pretty familiar trade-offs that put systems and process over solving for customers. One example is how we run our sales process. We have several ways in which leads can “raise their hand” to talk to sales. So you would think we would get them in touch with a salesperson ASAP ... oddly, you would be mistaken. Instead we put them in a lead queue for data enrichment. This is great for our system -- it allows us to get the right lead to the right territory and industry vertical. But it's terrible for prospects who indicate interest, only to wait ... and wait ... and wait to hear from someone. And as we have all experienced, technologically complex systems break, meaning some prospects never got a follow-up. We say we're customer-first, but this practice is much more customer-eventually. On each of the points above, I can tell you the story of decisions that were made that created the sharp edge, and they're all pretty reasonable. We were making incremental decisions that allowed complexity to sneak it. We certainly didn't set out to create customer pain, no business does, but we were ultimately solving for the constraints of our systems -- whether technology, process, or people. Systems and process are important, they help companies grow. 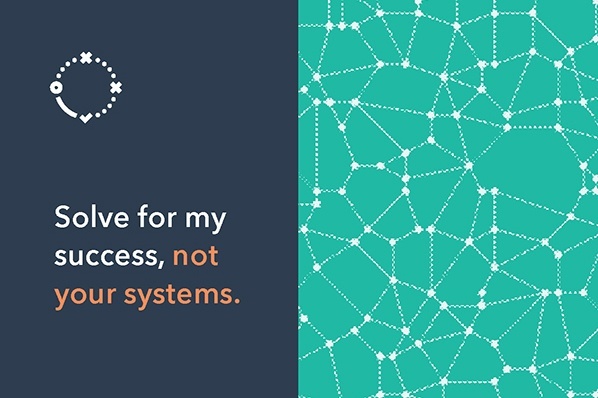 But systems and process should always be secondary to the success of your customers -- that's how you grow better.